Price: £1.60 (incl VAT) Sorry, this item is currently unavailable. Click here to receive notification when this product comes back into stock. 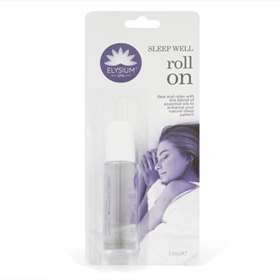 Elysium Spa Sleep Well Roll On 10ml contains a blend of essential oils which help to enhance and improve your natural sleep pattern. Sleep Well Roll On consists of a therapeutic blend of Lavender and Eucalyptus Oil to help relieve nervous tension, stress and irritability and improve sleep quality. For a good nights sleep simply apply to the pulse points on the soles of your feet, the wrists or temples shortly before bedtime. If this occurs wash affected area thoroughly with water. Cocos Nucifera (Coconut) Oil, Lavendula Angustifolia, Eucalyptus Globulus Oil, Linalool, Limonene, Geraniol, Coumarin. Product code: 48573O Price: £1.60 (incl VAT) Sorry, this item is currently unavailable. Click here to receive notification when this product comes back into stock.